OK, I am back. I tried restarting Firefox, but still everything was in Chinese. It's difficult trying to make your way around, when things aren't in a romanized alphabet. Even websites you are familiar with are difficult to navigate when you have to try to remember or guess what each button does. Once my wife finished her game of "Bookworm Adventures", we went to the hawkers stalls by the Lake Gardens to eat. My wife wanted "Nasi Ekonomi", which is the Chinese food equivalent of the Malay food "Nasi Campur", and the Indian food "Nasi Kandar". Nasi, by the way, is Malay for rice. In all of these, you get a plate of rice, and then choose from a bunch of prepared dishes, like a buffet. My wife was insistent, though, that she just wanted to eat at that one hawker stall by the Lake Gardens, because the woman has fried pork. Well, guess what? She wasn't there. So we went wandering all over Taiping, looking for a place suitable for her (and the babies) needs. This took a lot longer than it usually would, as most places were closed for the beginning of the Chinese New Year celebrations. Almost all of the Chinese run restaurants were closed. So guess what it was that my wife was craving? That's right- Chinese food, and nothing but Chinese food. So we wandered all around Taiping, looking for a suitable place. If a there was a place open, there was always a reason why she didn't want to eat there. Mostly, it was because "It's not what I want." I know it's crazy being pregnant, and it makes women do strange things, so I went patiently along. Eventually, my wife tired out when we got to the Indian section of town, near the Taiping hospital. Then she decided Indian food would be OK, because at least she could get a variety. As it turns out, the Indian restaurants weren't well stocked. Our favorite one, the Annapoorana restaurant,didn't have much more than roti canai. While we enjoy roti canai, it was not what she wanted. The situation was the same at our second choice, the Sugantha restaurant. Our friend Rod Deering eats there, and he is super-particular about what he eats, so you know it is good food. We walked across the street, and there was a banana leaf restaurant. She decided that that would do. Not that we had much choice. 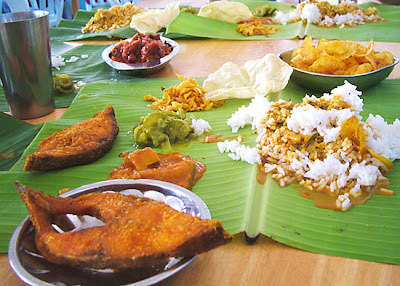 In a banana leaf restaurant, a banana leaf is put in front of you, and you eat off of that. Then someone comes around, and puts a huge amount of steaming rice on your banana leaf. Then they come back with buckets of condiments, and throw that on your banana leaf. After that, they ask you what kind of curry you want, and slop that on. Then you eat it with your hands. It's all great fun, and great food. Top it off with some teh tarik, and you got yourself a meal. "You didn't get me Chinese food". OK, only six more months of this to go!